– Women in the Pet Industry Network (WIPIN), a leading organization focused on women entrepreneurs in the ever-growing pet industry, has received a nomination for Laura Pakis as their 2013 Entrepreneur and Rising Star. Pakis is owner and founder of Acme Canine, in Lewis Center which trains dogs based on their personality and temperament while addressing any behavioral issues the dog may have. According to the 2011-2012 American Pet Products Association’s National Pet Owners Survey, there are more than 78.2 million pet dogs and 86.4 million pet cats. The economy has not slowed the rate of spending on pets. Estimates show pet owners in the United States spent $52.87 billion on their pets in 2012. More and more services are being provided to help pet owners take the best care of their animals. “Our network continues to grow with the addition of talented entrepreneurs such as Pakis,” said Shawna Schuh, of WIPIN. “Each member brings a unique perspective and adds to our exchange of ideas, information and contacts. Our members hail from companies focused on everything from puppy products to wildlife sanctuaries. We are building a network of movers and shakers across multiple fields within the pet industry. As members of WIPIN, women from all over the United States can connect as if they were at a business lunch,” added Schuh. 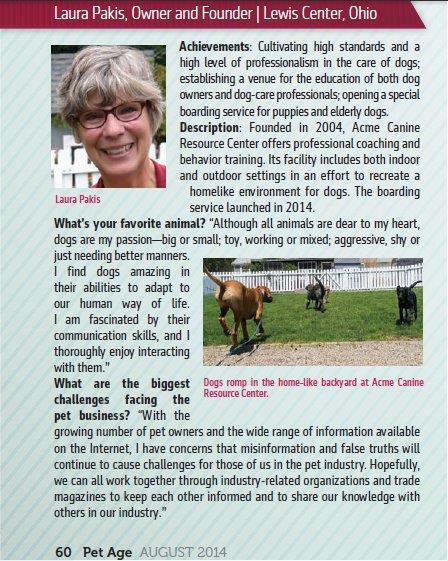 About Laura Pakis and Acme Canine Pakis’ dog training business has grown from half a dozen to over 4,000 clients since she began training dogs for a living in 2004. Acme Canine’s staff enjoys working with all breeds and all ages of dogs. They are committed to making dogs polite members of society and a joy to own. All members of the Acme Canine staff believe in maintaining the highest standards of professionalism and business practice as well as keeping abreast of the latest methods, practices and techniques of dog training. Since its formation, Acme Canine has expanded to a larger home-based facility to better serve the Central Ohio dog owner community. Keeping with its mission, Acme Canine continues to utilize a variety of innovative and individualized techniques to teach dog and owner a positive method of living and learning together. You can reach Pakis at (740) 548-1717; or training@acmecanine.com. Her business website is acmecanine.com. About Women in the Pet Industry Network Established in 2010, WIPIN is headquartered near Portland, Ore., and currently serves a membership base approaching 230 women entrepreneurs worldwide. WIPIN offers two levels of membership, Professional and Corporate, and members come from all categories within the pet industry, from groomers and veterinarians to pet sitters and pet boutiques. WIPIN is affiliated with Black Dog Education, Animal Wellness Magazine and PetIndustryTV.com. For more information, please visit www.womeninthepetindustry.com, or contact Schuh at 503-970-5774, 877-474-2962 or Shawna@womeninthepetindustry.com. 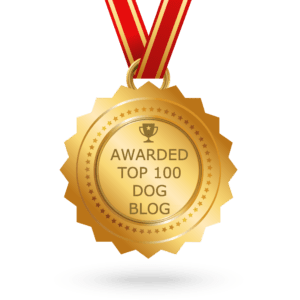 This entry was posted in The History of Acme Canine and tagged Acme Canine, dog industry, dog professionals, Laura Pakis, professional women, Shawna Schuh, WIPIN, women entrepreneurs, Women in the Pet Industry Network. Bookmark the permalink.